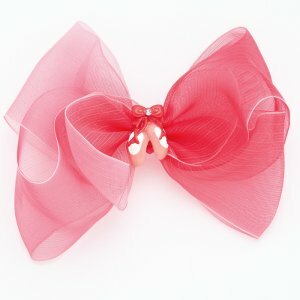 This large chiffon 4 way bow features ceramic ballet slippers underneath a matching bow in the center with a small crystal stone in the center of the bow. The fuchsia color transitions to lighter shades of fuchsia and pink accentuated by thin matching stripes. Mounted on an alligator clip.